I grew up in a small town in southern Ohio where there wasn't a whole lot to do. As a little girl, I spent hours playing make-believe. At six, it was cute, but at sixteen, it was a tad nerdy. Who could blame me? My make-believe worlds were much more interesting than my real life, and the heroes were more romantic than the boys in school. I’ve always loved to read, and still, even today, fall hopelessly in love with the heroes who came alive on the pages of my favorite books. So, it seems only natural I put my imagination to work as a writer of romantic fiction. Though now I consider myself a hopeful romantic... because of my stories all end with a happily ever after. 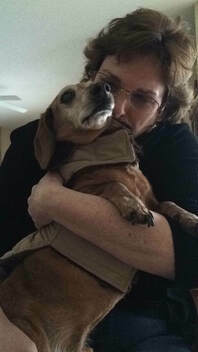 ​I live in Michigan with my husband and a needy 17-year-old dachshund who has dementia but on his good days still acts like a puppy and tears into any trash can left unsecured.